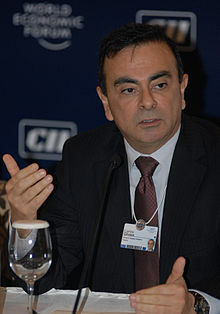 Carlos Ghosn is a French-Lebanese-Brazilian  businessman. He is currently the Chairman and chief executive officer of Renault, which is based in Paris. He holds the same positions at Nissan, based in Japan. Together, these companies produce more than 10% of cars sold around the world. Ghosn is also Chairman and CEO of the Renault-Nissan Alliance, the strategic partnership overseeing the two companies through a unique cross-shareholding agreement. He was born in Brazil. ↑ Jolley, David (29 June 2013). "Ghosn becomes chairman of Russian carmaker AvtoVAZ". europe.autonews.com. Automtive News Europe. Retrieved 29 June 2013. ↑ "Carlos Ghosn Net Worth". Celebrity Net Worth. 5 December 2010. ↑ magazine, Le Point. "Le Point – Actualité Politique, Monde, France, Économie, High-Tech, Culture". Le Point.fr. ↑ "Renault-Nissan 2011 vehicle sales reach 8.03 mln". Reuters. 2012-01-10.